For close to a year now, the students of Chile have been in open revolt. Demanding free education from pre-school to tertiary level, students in Chile have organised the largest social movement the country has seen since the fall of the return to democracy two decades ago. Mass demonstrations, nationwide general strikes, militant occupations and blockades of schools and universities, sit-ins, “kiss-ins”, mass flash-mob renditions of Michael Jackson’s ‘Thriller’, and of course, water cannons, tear gas, running battles with carabinero militarized police; these are the hallmarks of the Chilean student movement. Its goals, though multifaceted, have been clear: greater student control over education, an end to cuts in the education sector and to private profiteering, free education for all. In the words of a popular slogan: “Fin al lucro en la educacion, nuestros sueños no les pertenecen.” Education is not for profit; our dreams are no one’s property. 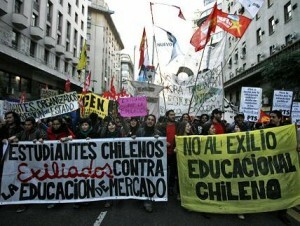 Chileans has long served as a training ground for radical cuts to social welfare and education. 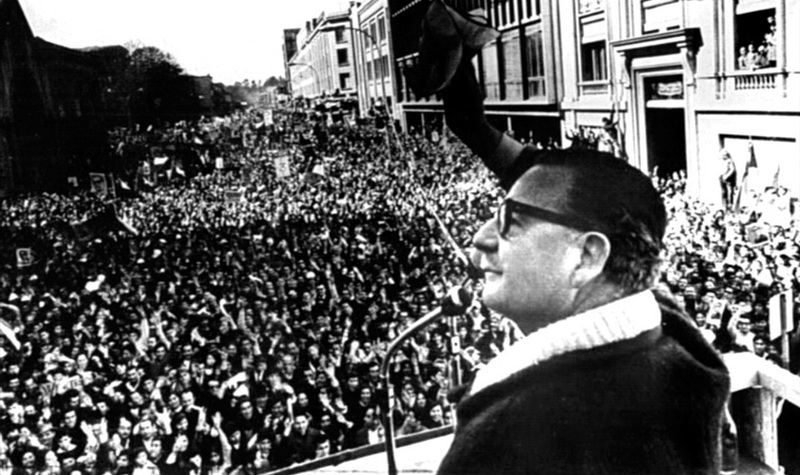 In 1970 the people of Chile elected a Marxist President, Salvador Allende, only to have him ousted three years later in a CIA-orchestrated coup, after which they endured close to two decades of brutal military rule under Augusto Pinochet. Under the dictatorship, Chile became a neoliberal experiment. Universities were considered hotbeds of radicalism by the regime, thus the education system was hard hit by reforms. Funding from the national government to the education sector was slashed, placing the burden instead on municipal governments. As expected, schools in richer municipalities thrived, while those in poor areas suffered or closed. User pays was introduced. Steadily, the education gap widened to a chasm. Today Chile has some of the highest fees in the OECD, and the highest proportion of private education providers. Cost does not meet quality, with Chile performing worst in subjects like reading. Today, 40% of the cost of education is placed on households, with the government funding a mere 18% of public education. As a result, many Chileans are excluded from higher education due to exorbitant fees. Though protest against the brutal right-wing economic policies of successive Chilean governments has been consistent since the end of the dictatorship in 1990, last year represented something of a rebirth of the student movement. Hot on the heels of the Arab Spring and alongside the Greek uprising and austerity revolts in Europe, Chilean students have helped to usher in a new era of social unrest and change globally. Historically, social unrest has been contagious. Student movements in the US and Europe and the 1968 uprising in Paris came at a time of then unprecedented strike action and protest in New Zealand’s history. Last year, New Zealand pundits spoke of a renewed student movement here, with large-scale student protests and occupations in Auckland and Wellington. Within Latin America alone, resistance to the ongoing neoliberalisation of education by Chilean students has already spread to Colombia and Argentina. Below is a timeline of the student movement beginning last year. It serves as a testament to the courage and resolve of Chilean students despite brutal repression, and to the power of mass mobilization to effect political change outside of elections. In 2012, student leaders have promised another year of struggle for free education in Chile. Recent polls have shown that Chilean students and their plight for free education are supported by 80% of the population, and alliances forged with trade unions and large parts of the working class threaten to transform the student movement into something much bigger. On the frontlines, the war for education in Chile shows no signs of abating. The election of Gabriel Boric as President of the University of Chile Student Federation, with his platform of no compromise, and further escalation of police repression late last year, bodes for another long hot winter for Chile’s students. May – Chilean Education Minister Jaoquin Lavin proposes increasing government funding to private tertiary instutions that exploit legal loopholes to profit from education provision.